This species, Gonatodes albigularis, can usually be found on surfaces two to three meters above the ground. Not surprisingly then, I spotted this male just above eye-level on the side of a tree, shortly after dark. 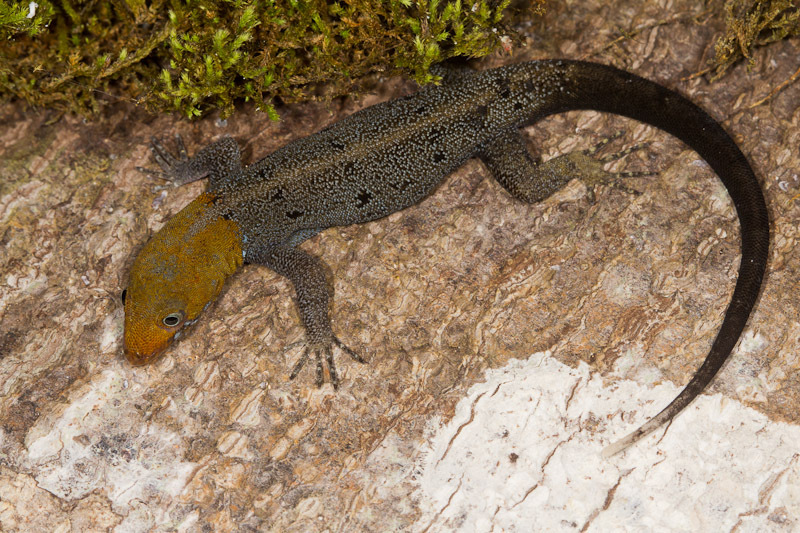 Male coloration as shown here is distinctive among Costa Rican lizards. Interestingly though, coloration changes after dark. The head darkens a bit and the body lightens somewhat. Both still remain distinct from each other. What you see above then is the night color phase, or perhaps a transitional phase between the two. Males also have that white-tipped tail. As the round pupils suggest, this is a diurnal lizard. I didn’t measure this one, but they generally grow to around 9cm.